In recent years I've become intrigued by the possibilities of live looping for doing solo gigs. For those who don't know what it is, it's essentially recording a repeating loop live on stage, to provide a backing track for a piece of music. You can add to the loop and stop/start it. It's very easy for things to go horrendously wrong in laying down that first loop - for example, if the loop is either too long or too short, or speeds up. That can be very embarrassing, as you either have to live with it (painful for you and the audience) or simply start again (which makes you look foolish). Neither is something you want to have happen in front of people, so the key to good performance looping is practice, practice, practice in your bedroom first! Some people (especially folk music purists!) disparage looping as "Just playing along to a backing track". But it's not the same as putting a pre-recorded backing track on at all. It takes a lot of skill and confidence to do it on stage. I always create my loops live and fresh in the moment, with all the potential for disaster that entails. And it's just me on stage creating the sounds, whether beat-boxing, playing the harp, or using mouth noises in combination with technology to create bass lines and other original sounds. Looping this way is as much a live creation as playing the harmonica or singing itself, except bits of it are saved and used to create the backing. For those reasons I generally prefer smaller groups. The smallest and often the best is a duo. If you can find the right person you get the essential excitement and interaction of a band, and can make a very big sound too! It's the most economically efficient performance group (you can charge less overall but make more per person), there are fewer problems with amplification, a duo fits into a bigger variety of situations, travel and accommodation costs are cut down drastically, and the dynamics are unsurpassed. You can spin on a dime if one of you wants to take things in a new direction, and that helps keep the music fresh from night to night. I've been blessed to play with some brilliant and inspiring duo partners. The first was New Zealand guitarist Gary Verberne, an awesome powerhouse on stage! 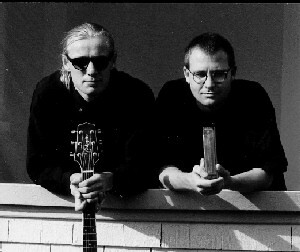 Gary was already a star in some of NZ's biggest rock bands of the time, and I was honoured that he took on the challenge of a couple of acoustic duo tours around the country with me in 1990/91. Those tours were so much fun! We played some great gigs in often pretty sizeable venues, and made good money too. Gary and I recorded a couple of cassette-only albums to sell on tour Live at Scoop de Loop and Licks & Spits. 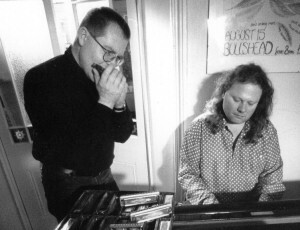 Soon after I moved to the UK in 1992 I had the good fortune to jam with jazz pianist Geoff Castle. Geoff had been gigging constantly since his teenage years as one of the stars of the British National Youth Jazz Orchestra, and had an impressive pedigree in seminal UK jazz fusion bands like Nucleus. I've found that many jazzers can tend to be a bit snobbish about 'simpler' forms like folk and blues, but not Geoff! An immensely soulful, simpatico player with a big heart to match his love of good food and beer, Geoff brought all his experience and sensitivity to bear on whatever he played. He liked my eclectic range of material and, in addition to live gigs, we've collaborated on several albums: Harmonica After Hours, Brendan Power Plays the Music of Riverdance, and a trio album with Lucy Randall, CPR. 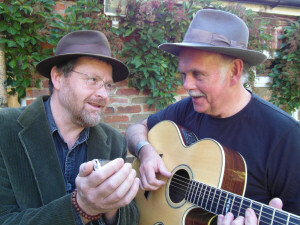 I started doing solo spots in UK folk clubs and soon fell in with Mayo guitarist Frank Kilkelly - then a resident of London's County Kilburn (so named because it housed so many Irish expats). 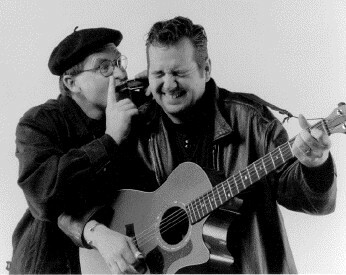 Frank blended his roots in Irish traditional music with his passion for Gypsy Jazz, and was a great musical companion as we toured the length and breadth of Ireland and the British Isles in the mid-1990s. We made one CD - Jig Jazz. That title summed us up nicely! After a lucrative but ultimately mind-numbing stint playing in the Riverdance Show band from 1996-99, I hooked up again with an old friend from New Zealand, Andrew White. Andy is one of the world's finest fingerstyle acoustic guitarists - as well as possessing an awesome voice and being a composer of great songs. He should really be an international megastar, as he has the lifestyle to go with his talent! We toured in Ireland, the UK and his adopted homeland of Nova Scotia, Canada, playing a mix of our respective repertoires. Two CDs resulted from that partnership, Live in Ireland and Power & White. An enduring but less intense duo partnership is my one with Dave Peabody. Dave is a legend of British Blues; He lives and breathes it, and knows the date, time of day and weather for every historical Blues recording you could name. This deep knowledge has infused his music: he's from Brixton but the way he plays and sings you'd swear he was from somewhere near the Mississipi Delta! We've gigged on and off since the mid 90's and recorded one of my favourite albums in an afternoon - Two Trains Running. We will keep on doing gigs till one of us falls over, I think! 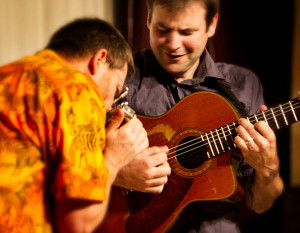 My most recent duo partnership is with multi-instrumentalist and force-of-nature Tim Edey. One of the most naturally gifted musicians I've ever met in terms of sheer raw talent, Tim can't read a note but has an incredible ear and musical memory. His main instruments are the Irish-style button accordion and the nylon-string guitar, both of which he plays with an energy that borders on the maniacal. He's great to play with on stage, as you never know what direction the music will go - it's different every night. 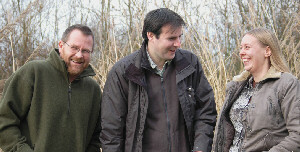 Since getting together in late 2010 we played extensively in the UK folk festival circuit and overseas. 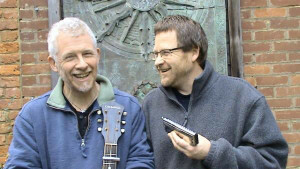 Audience reaction was great, and in 2012 we were voted 'Best Duo' in the annual BBC Radio 2 Folk Awards. We recorded one well-received album - Wriggle and Writhe. However we got more and more busy with our personal projects, and in December 2013 we parted to pursue our own paths.